Choosing the type of cruise you want is one of the most important aspects when searching for a cruising holiday. Aside from choosing your ideal itinerary and the right kind of ship, the type of cruise depends on a number of things, including where you want to go, when and for how long. A cruise from the UK offers you the convenience of not having to book an international flight to your departure port. Not only will you spend less time travelling before your holiday begins, but these cruises are ideal if you’re looking for a shorter break due to time constraints. There are a number of ports around the UK offering a range of different itineraries to a host of destinations. The biggest concentration of ports is in the south of the country, with Southampton being the most popular and a home port for a number of cruise ships, Tilbury is also a key port which serves London. Cruisers who live in the north of England will find a number of departures from Hull and Liverpool, while in Scotland the port of Leith serves the city of Edinburgh, with Rosyth also close by. Over on the west coast of the country, Greenock is the port which serves Glasgow. When it comes to UK departures, the world is your oyster where you can travel to such far-flung destinations as the Middle East, Africa and the USA. There is a large choice of Mediterranean, Northern European and Caribbean itineraries when you sail from the UK, with departures from Scotland offering an excellent choice of sailings to destinations throughout Northern Europe, including the Baltic capitals and the breathtaking Norwegian Fjords. If you want the ultimate in choice and access to the largest range of itineraries, then a fly cruise is certainly for you. From Italy and Spain to the far-flung ports of the Far East and Australia, there are so many departure ports to choose from. Often, a fly cruise will be a round-trip from the same port, offering you the convenience of a return flight to and from the same destination. Sometimes, fly cruises are available with a cruise-only price, leaving you the freedom to book flights with your chosen retailer and at a specific departure time. These are also sometimes available as special deals with flights included in the price you pay, offering even better value. To extend your holiday and see more of the region you’ll sail from, a cruise and stay is an excellent choice. You’ll fly out from the UK but instead of travelling straight to your departure port, you’ll travel to one of our chosen hotels in the region. Cruise and stays are only limited by your imagination and combine all the elements of a land holiday and a cruise. Whether it’s a city break in New York, Dubai or Singapore, or a fun-packed Orlando adventure, there’s a cruise and stay for you. It’s not just about your hotel and cruise ship though, as when you book a cruise and stay package with us, we can tailor your stay exactly to your needs, with any excursions or land tours you may want to book included in your price. 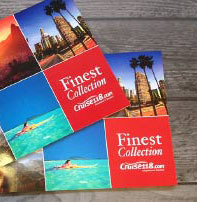 Here at Cruise118, we have a dedicated Cruise Concierge team who are experts in all things cruise. If you’d like some help in deciding which type of cruise is right for you, just give us a call on 0808 1234 118 and we’ll be happy to answer all your questions.